The Frontier Hawk brought to you by Cold Steel is a joy to use. Lightweight, it reduces wrist, elbow and shoulder strain without sacrificing anything in chopping power or ease of handling. 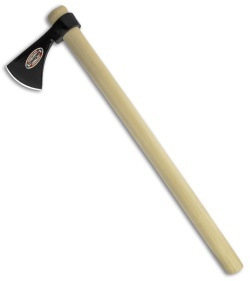 It features 22" of American Hickory, a drop forged 1055 carbon head, and weighs a mere 22.4 ounces. This Cold Steel Frontier Hawk is suitable for re-enactors from any period stretching from the French & Indian War to the final settlin' of the West in the late 1800's.